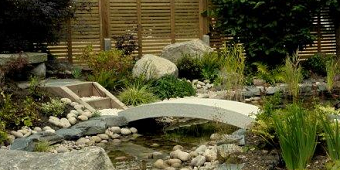 The best word to describe how a pond bridge looks nestled over a garden pond is distinctive. They help to add height, interest and contrast with varying styles, shapes and finishes. Including a bridge in any pond design will increase your choices for the possible fish pond feature location. This is particularly useful for small or long and thin gardens. Pond and water feature bridges. 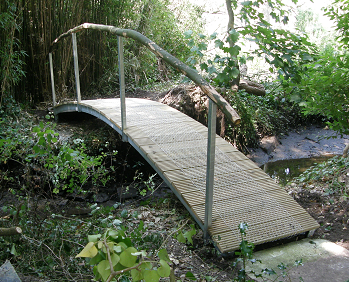 There are two common pond bridge shapes, curved and straight made with or without hand rails. Although these specifications are quite simplistic the styles and designs available to buy are massive. I am going to list some of my favourites in this article and hopefully help you to find and buy your perfect pond bridge. Pond bridges and garden design. When designing a pond or water feature to include a bridge you will need to take a few restrictions into consideration. The first is the length; most commercially available garden pond bridges have a maximum span of around 3.6 to 4 meters. You would not want to bridge a gap less than 1 meter. This would look strange and cause problems with pond construction. I would suggest stepping stones if you do need to do this. I should also mention not to design your bridges width to be less than 60cm. The second consideration and just as important is the weight and project area accessibility. I know this should be second nature for all you garden pond designers but it’s a mistake I have seen more than once, so worth a mention. The most popular and cost effective pond bridge is the basic wooden structure. Available in flat pack form or part built, the bridges can be ordered on-line and then transported to the pond area to be constructed. You do not have to be building a new pond to incorporate a pond bridge but you will want to consider how the bridge feet might be stabilised once in place. To keep your wooden pond bridge in tip top condition make sure that the feet do not sit in water or on ground soil or grass. I would suggest lifting the bridge up on slabs or concrete. Wooden garden pond bridges should be treated with wood treatment once a year. The curved bridge above shows why it’s worth paying a little extra for hardwood like oak or redwood. The bridge was made over ten years ago and has missed a few coatings but is still as strong as the day it was installed. If your looking pressure treated garden bridges click on the picture below, Tony Ward Garden Furniture. I have used this low curved bridge without a handrail in a recent pond design. It suits Japanese or cottage style design. Metal pond bridges tend to suit larger projects that have good access as they need to be constructed of site in the work shop and shipped to the pond. They have the huge advantage that they will last for almost ever and require little maintenance. Other advantages using metal structures is the length of the bridge span can be greatly increased? Styles produced by artisan steel fabricators are endless. In a nut shell you are limited by budget not possibilities. 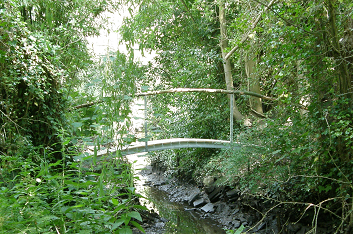 The 5 meter metal pond bridge above was designed and constructed by Peter Dunwoodie. If you are interested in his work or would like to discuss your project please contact us via email or call us- 0800 0232 988. My last recommendation is the heavy stone built or carved stone pond bridge. You can buy or build a stone bridge. Just a word of advice, if you are going to build your stone bridge it may be worth showing your plan to a structural engineer or experienced builder as you will be limited on the maximum span. That said a stone bridge requires virtually no maintenance and will last forever and a day. The granite curved stone pond bridge above was used as part of a Japanese style garden. It weighed over half a ton and was way too heavy for four big men to lift. Luckily the garden allowed access for a JCB, a mini digger was not enough and a crane was too expensive. or call 0800 0232 988. Water Scenes have built ponds and water features for over 15 years and have a good reputation and vast knowledge in the fields of water feature design and fish pond design, construction and installation. If you would like to talk to us about a potential project or idea simply contact us by email or phone.